The Sun Rockabilly Legends is a tribute to the artists whos careers were launched by Sam Phillps and Sun Records. 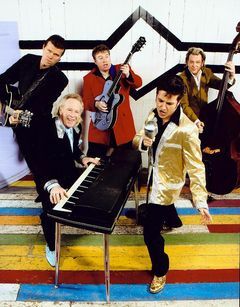 They are Elvis Presley, Johnny Cash, Jerry Lee Lewis and Carl Perkins. Sun Records gave birth to hits like “I Walk The Line”, Blue Sued Shoes”, “Whole Lotta Shakin’ Goin’ On” and “That’s Alright Mama” to name a few. The Sun Records Legends Show is a vintage snapshot in time presenting the early, electric sound of Rock & Roll. Extensive attention to detail ensures that each performance features amazing vocals, note-for-note guitar licks, upright “slap” bass, along with vintage equipment, microphones, instruments and wardrobe. The Sun Rockabilly Legends appeal to a wide demographic and the show is a sure-fire hit. Without a doubt, the audience is certain to leave the performance with their toes-a-tappin’, a smile on their face, and a song in their hearts!